A local resident asked us whether the billboard’s claim was accurate or propaganda. The short answer: Is it accurate? Kind of. Is it propaganda? Yes. Now the long answer. There is valid scientific research to back up the statement, but the statement, like many we see on billboards, is a bit misleading. The word I have a problem with is “better”. Sure, “better than” is a way to compare two things in simple, easy-to-read language, but what does it mean that young trees are “better than” older trees at removing carbon from the atmosphere? Reproducing by making flowers, seeds, etc, and so forth. What the science shows is that younger trees are able to allocate a greater percentage of the carbon they take in to making new wood, than older trees are. Older trees must use a greater proportion of their absorbed carbon to maintaining existing systems. Kind of like a human child, who might consume the same or fewer calories than his/her adult parents, but whose rate of growth is much higher. The problem here is that this statement is a sound bite on a billboard taken out of context. If society is concerned about keeping carbon out of the atmosphere now, then larger trees, which contain lots of carbon already, should stay standing, instead of being cut down and replaced with small trees. Sure, by growing large trees and then cutting them, much of their carbon still stays out of the atmosphere because they are turned into building materials and other “long-lived wood products”. But some, non-negligible percentage goes back into the air, either from slash burning, decomposition, or being converted to paper or other “short-lived” products. There are hotly contested debates in the scientific community about what that percentage actually is. 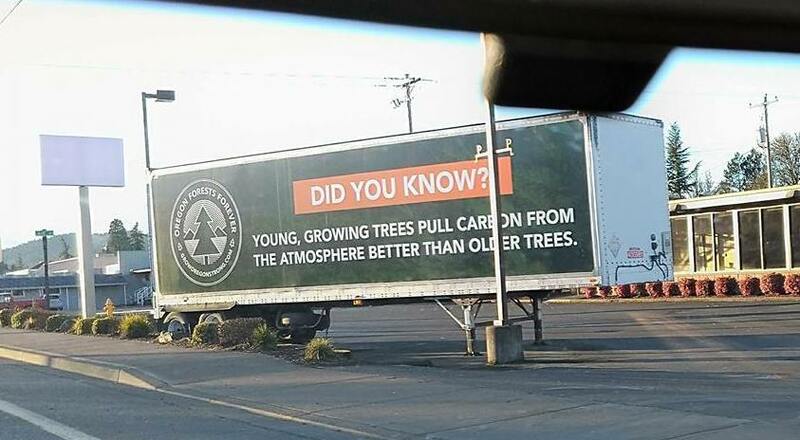 The bottom line is that this advertisement is taking a sound bite from science and using it to promote what its sponsors would like society to feel good about: growing trees on short rotations. 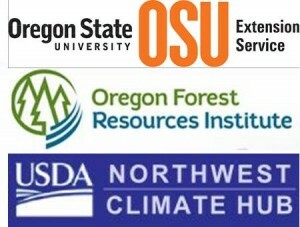 Environmental interests are equally guilty of doing the same thing with other sound bites (here is an example of that). When managing our forests, we are choosing to prioritize among all of the potential benefits that forests provide: wood products, carbon storage, biological diversity, and much more. There is one fact that both sides can agree upon: trees (young or old) are better than no trees at all (e.g. a parking lot) when it comes to combating climate change.